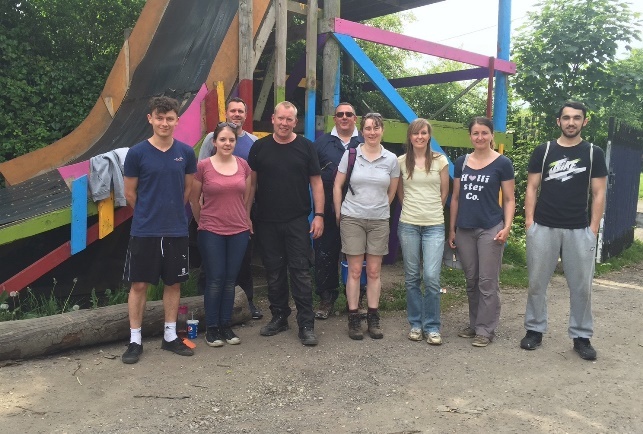 Staff at Bradford-based laundry chemical manufacturer Christeyns took a day out from their busy schedules recently to help rejuvenate the Big Swing Adventure Playground in Eccleshill. Christeyns, which has its head office in Rutland Street, offers all its 130 members of staff the opportunity to take paid leave in order to help out a local charity or good cause through its volunteering initiative. On this occasion nine members of staff, including managing director Nick Garthwaite, spent a day carrying out an extensive range of tasks including painting, gardening, treating timber structures and repairing walls and paths. Chris Reed, Warehouse Team Leader acted as team co-ordinator for the day, which ended with a well-earned try-out on the zip wire. The Big Swing Adventure Playground, also known as Eccleshill Adventure Playground, is an open-access playground for children and young people aged five to sixteen. It is the only adventure playground in the Bradford and Leeds area and children have the opportunity to take part in more traditional adventure type play, structured around the elements of earth, wind, water and fire. Activities include den and structure building, team games, cooking campfire style and trying out the zip wire. The Big Swing is a registered charity and provides free evening and weekend play sessions as well as family sessions on Saturdays. Christeyns UK is part of the Christeyns group, based in Ghent, Belgium. Its principal focus is the manufacture and supply of detergents and supporting chemicals for the commercial laundry sector across the UK in which it is the market leader. In addition, Oscrete, its construction products division manufactures a range of high performance super-plasticising admixtures, waterproofing agents and efflorescence controllers for the construction sector.